Monster Prom, a kickstarter game published on Steam by Those Awesome Guys is a dating sim that knows the market it’s inhabiting. In a world that’s currently fascinated with dating sims like Doki Doki Literature Club, it provides an oasis of tongue-in-cheek humor blended with genuine challenge, beautiful art, and enough drama to keep players entertained for a while. The first step to playing a game of Monster Prom is picking from a platter of four characters, choosing your preferred pronoun, and entering a name. Shortly following is a three-part quiz from an underworld version of Seventeen magazine that determines your starting stats and establishes a relationship with one of the six monsters to date in the high school of the damned. The cast of dateable hotties is all self-aware in design. Characters like a daddy’s girl whose father rules over the seas, a hipster vampire who’s millennia old, or a Gorgon with the disposition of Daria, all put a funny twist on the usual cast found within the high school setting. Anything goes in this school. At the beginning of each phase, you get to choose a place in the school to spend your turn in. Staying in different parts of the school raises different attributes and triggers an event afterward that helps progress ties with the other characters. On a typical playthrough, you might find yourself as a royal advisor for Scott the Werewolf, who was recently elected to rule over a kingdom of fur-suited mummies, or as a mob boss for Vera the Gorgon, aiding to spread her stone-cold fist in the underworld of the underworld. While there’s a distinct lack of art representing these events, the writing is detailed, elaborate, and hilarious — not to mention varied. Monster Prom boasts 388 different events with a whopping 1300+ different outcomes which encourages the player to come back and try their luck to woo another ghoul. The most challenging aspect of Monster Prom is earning enough brownie points to woo the monster of your choice. While it will be tough and might subject the player to several failures, this is also a flaw in the design of the game. As mentioned earlier, the questionnaire presented at the beginning of each match automatically grants the player a relationship with one of the six monsters based on their answers. For example, if you got matched with Scott the Werewolf, he is more likely to show up during events. If you really wanted to date another character, you might find it tough to find opportunities to engage them. On top of this, it’s not easy to gauge the personalities of the separate dateable characters during your first few playthroughs, despite their short bios during the introduction of each game. 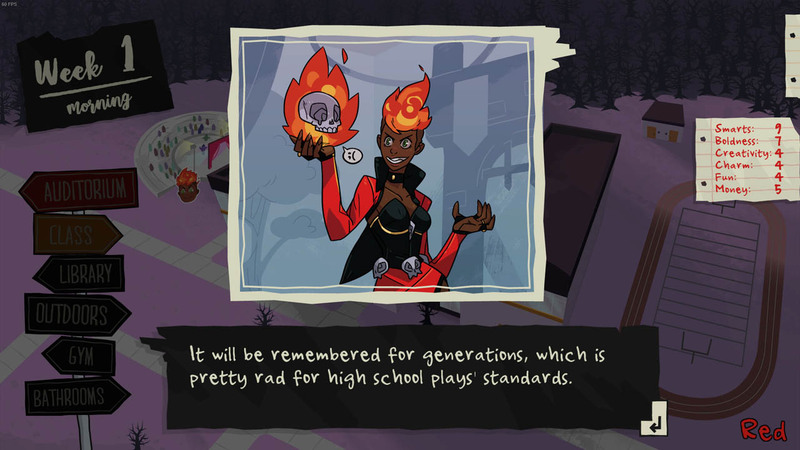 This system makes Monster Prom slightly uninviting for new players. But once you learn the backgrounds and mannerisms of the cast after a few practice rounds, it’ll be a cakewalk because you’ll know that Liam prefers photogenic forks as opposed to spoons, Miranda should obviously buy Tinder, and Damien is always looking for the most upsetting, violent, and least intuitive answer to any situation. When faced with a scenario, several solutions appear at the bottom of the screen. It's up to you to decide which answer will work out favorably. Some choices increase your relationship with individual characters while throwing other characters under the bus, while other options might have a 50/50 chance of telling the character what they want to hear. It can be difficult gaging which answer will serve in your favor during these situations and which will make your crush yell at you. With that being said, the writing saves the day again. Picking the wrong answer can lead to funny interactions that might cost you the game, but helps weave development into the cast of characters and shows that there’s a lot of depth behind the initial cookie-cutter vibes they emanate. The mood is set, the game is over. Who will you ask to prom? A trembling finger clicks on the monster that’s held your beating heart since you first laid eyes on them. Will they say yes? Will you have the most memorable night of your life with your cryptid crush? Or will you be dejected, made a laughing stock of all the abominations at school? Did your friend already woo the monster you wanted? The tense atmosphere created during the final few moments of each playthrough are expertly executed, drawing out just the right amount of tension and drama. Each win feels exhilarating and each loss is heartbreaking. But that’s alright; there’s always another chance for true love on the best night of your life in the world of Monster Prom. Monster Prom’s formula is simple: Pick a monster, choose the right answers, and go to class in between. While this doesn’t sound like a whole lot, there’s lots of beauty to be found in this game. It’s a dating sim that doesn’t take itself too seriously, and that’s what makes it a game to bring to a party. Multiplayer can get intense when both players want to take the same monster out for one of the best nights of their lives, while single-player is also a very viable mode that’s lots of fun. Replayability is high thanks to more than a thousand different outcomes and hundreds of various events. Monster Prom is a night that shouldn’t be missed.